My daughter is now nearly six months old. Right about when she turned two months, my 3.5 year old started day camp. At camp orientation I was given a shockingly long list of food items that I could not pack in my son’s lunch due to his bunk mates’ allergies. My initial concern was figuring out what I could send that my picky son would eat. Once I figured that out, I moved on to researching what I could do to prevent my baby from developing food allergies. This post is sponsored by Ready, Set, Food!. Thank you for supporting the brands that I love and making this site possible! This post also may contain affiliate codes and links. Please see the disclosure page for additional information. I included a valuable discount code at the end of the post. I was relieved to learn that three recent clinical trials have shown that introducing potentially allergenic foods to infants early and often can significantly reduce the risk of infants developing food allergies. I’m already pretty overwhelmed with the craziness of having two kids and two family businesses, so I wasn’t confident that I’d remember to give these foods regularly. I was also uncertain of the amounts to give each day. Then I came across Ready, Set, Food!, which offers a guided system of gentle introduction of organic powdered milk, egg and peanuts. I’ve been using it for the past couple of months and find it so simple and easy. I just pour one packet into my daughter’s first bottle of the day and don’t think about it again until the next morning (you can also mix it into food)! I’ve been recommending Ready, Set, Food! to all of my new mom friends (and sharing the 50% discount code below) and am always met with questions on food allergy prevention in general. 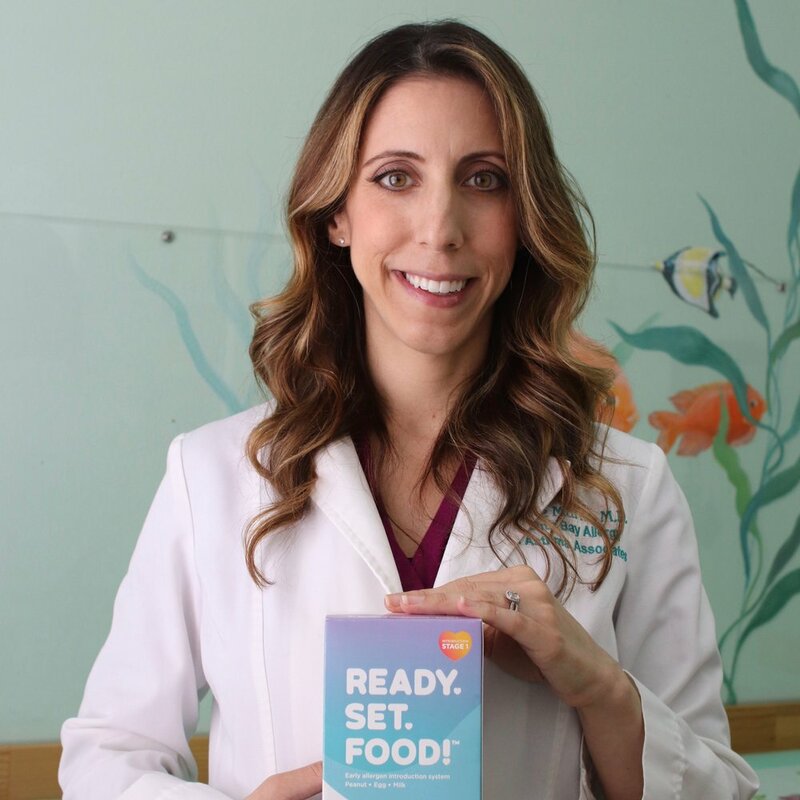 I’m thrilled to have worked with Ready, Set, Food!’s Chief Allergist, Katie Marks-Cogan, M.D. on this Q&A, which answers many common food allergy prevention questions. Katie Marks-Cogan, M.D. is board certified in Allergy/Immunology and Internal Medicine, and treats both pediatric and adult patients. Also a big thanks to the members of my NYC Moms of 2018 Babies Facebook group for helping me formulate these questions! Common Food Allergy Prevention Questions, Answered! What are the most common allergenic foods? The top eight, most common food allergens are: milk, egg, peanut, tree nuts, soy, wheat, fish and shellfish. These comprise 90% of all food allergies. However, milk, egg and peanut represent the vast majority of childhood food allergies-- over 80%. And about 30% of children with food allergies are allergic to more than one food. Childhood food allergies seem to have increased dramatically since my childhood, why is that? Food Allergen Avoidance - The previous recommendation was that parents avoid allergenic foods for their child’s first year, which is now considered a risk factor for food allergy development. Vitamin D Insufficiency - There is evidence that suggests that infants with low Vitamin D levels are more likely to develop food allergies. The Hygiene Hypothesis - Lack of exposure to germs and/or allergens can skew a child’s immune system towards the development of a food allergy. Dual Allergen Exposure Hypothesis - Multiple studies (such as this study) suggests that exposure to allergens through the skin can actually promote allergy, while early oral exposure can promote tolerance. To learn more about why food allergies are on the rise, check out our blog post on The Growing Food Allergy Epidemic and What Parents Can Do To Prevent Food Allergies. What can parents do to prevent their babies from developing food allergies? If Your Child Has Severe Eczema: Discuss the new guidelines with your pediatrician at your child’s next well visit, especially if your child has severe eczema as an allergy screening may be required first. Don’t Delay, Start Early: Starting as early as 4-6 months of age may be more effective at reducing baby's risk of developing food allergies, but early allergen introduction is still recommended for babies up to 11 months of age. Positive results have been seen in the studies for babies who started even as late as 11 months old. However, delaying allergen introduction may put your child at a greater risk for developing a food allergy according to recent studies. Choose A Time That’s Best For Your Baby: Parents should only plan to introduce allergenic foods when their baby is healthy and an adult can monitor for any signs of a reaction for 2+ hours. Early AND Often: Sustained introduction for several months is just as important as early introduction. In recent landmark studies that resulted in 67-80% reduction in certain food allergies, participants sustained exposure multiple times a week for 3-6 months or more. However, Sustaining Exposure Is Hard: It’s challenging for parents to sustain exposure because simply put, feeding infants anything is challenging. In fact, one of the landmark studies (EAT) was only able to achieve 50% compliance among participants, suggesting that early and sustained introduction is difficult at such a young age. Does eating allergenic foods while pregnant or breastfeeding help to prevent allergies in children? Currently, there is not enough conclusive evidence to support that specific maternal diets during pregnancy or breastfeeding can be protective against food allergy, but this area is still being studied. So, medical guidelines still recommend early and sustained allergen introduction for infants regardless of a mother’s diet. Does the dairy in formula fit the bill for early and sustained introduction to prevent a dairy allergy? There hasn’t been sufficient evidence supporting exposure to cow’s milk protein-based formula and infant food allergy prevention. Therefore, early and sustained allergen introduction is still recommended for formula-fed infants. When starting solids, is introducing only one new food every few days really necessary? Per pediatric guidelines, it’s recommended to introduce only one new food at a time and wait at least 3-4 days between foods. This allows you to rule out a single food in case of an adverse reaction. I've heard of parents introducing peanut butter in the hospital parking lot "just in case." How common are severe reactions and do they typically occur at the first introduction or later? It’s very common for parents to be nervous introducing allergenic foods like peanut butter. In the three clinical trials that started early introduction as early as 3-4 months with over 2,000 babies, there were no cases of anaphylaxis or hospitalizations. Many parents are confused about how to introduce key allergenic foods by 4-6 months when their babies may not be ready for solids at that age, can you shed some light? The new AAP (and NIH) guidelines do recommend introducing allergenic foods such as peanut as early as 4-6 months, but it can be earlier than when many parents want to introduce solids as many babies are not developmentally ready to eat solid foods at 4-6 months. And even if they are, they tend to be picky eaters and it is difficult to feed them the same foods 2-3 times a week for several months. Fortunately, there are new products on the market that dissolve into breastmilk or formula, so you can still get the benefit of early allergen introduction without starting your baby on solids so early. You can read more about the new AAP guidelines here. What are risk factors for food allergies (e.g., eczema, family members with allergies)? There are many factors that determine your child's risk for food allergies including family history and gender but eczema or atopic dermatitis is the most important one to consider. This is primarily because research shows that infants with eczema are at the highest risk for developing food allergies. In fact, up to 67% of infants with severe eczema and 25% of infants with mild eczema will develop a food allergy. Therefore, infants with eczema need food allergy prevention and in turn, early allergen introduction, the most. However, parents of infants with severe eczema must consult with their pediatrician first before introducing any allergenic foods. Learn more about the link between eczema and food allergies here. Thanks Dr. Marks-Cogan for all of your great insight on this important topic! While these new guidelines can be overwhelming for many parents, fortunately, there’s a new, groundbreaking solution called Ready, Set, Food! that gives parents the tools to follow the landmark studies on food allergy prevention easily and safely and help reduce their child’s risk of developing food allergies by up to 80%. Ready, Set, Food’s pre-measured system mixes in easily with breastmilk, formula, or baby food, with a scientific approach based directly off the landmark clinical studies. Their formula uses the precise protein amounts used in the landmark clinical studies that showed a 67-80% reduction in peanut, egg, and milk allergies. $25 off ANY subscription when you click here and use code BESTBABY25 (or 50% off your first month when you click here and use code BEST50 on a month to month subscription, but BESTBABY25 is a better value) . I also have an Amazon discount code in my exclusive promos post. Enter to win a two month supply of Ready, Set, Food! If the above giveaway widget isn’t displaying properly, you may also access the giveaaway by clicking here (you may need to give it a moment to load). Dr. Marks-Cogan is board certified in Allergy/Immunology and Internal Medicine, and treats both pediatric and adult patients. Originally from Cleveland, Ohio, she received her M.D. with honors from the University of Maryland School of Medicine. She then completed her residency in Internal Medicine at Northwestern and fellowship in Allergy/Immunology at the prestigious University of Pennsylvania and CHOP. After finishing training, she moved to Southern California and currently works in private practice. She currently resides in Los Angeles with her husband, 3 year old son, and 2 month old daughter where she enjoys hiking, building LEGO castles with her son, and cooking with her family. She is a member of the scientific advisory board for Ready, Set, Food!